For four years, Britain's Royal Navy and Italy's Regia Marina waged a ferocious battle for control of the Mediterranean Sea. Fifty (yes, 50!) scenarios re-create these struggles: the battleship duels at Cape Teulada, First Sirte, Second Sirte and Cape Matapan. The convoys to Malta. The Italian torpedo boat Lupo's defeat of two British cruisers. 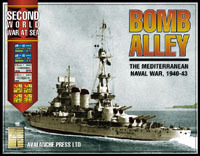 This is the ultimate World War 2 naval game, from the team that gave you SOPAC and Midway.